In honor of the Rhodes blogger demo I will be giving away a Rhodes gift pack. This is a wonderful giveaway! Please include me ~ and thanks for the opportunity to win! Rhodes sounds great. I didn't realize they were local. I now follow you on GFC. I found this post by following you on Twitter. Just voted for you on Top Mommy Blogs. Great site! 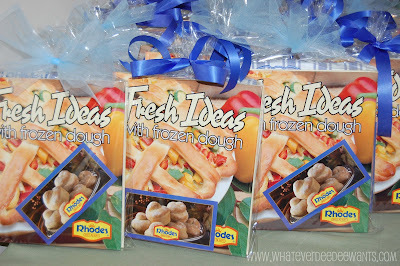 Rhodes bread dough is tried and trusted, an outstanding product. I have used it all of my married life. I've never had this before and would love to try it! I'm following this blog, I follow you on twitter and I voted for you! This would be fun to win. I need a new apron! Rhodes sounds like a great product and I would love to see the cookbook. Yummy! I'd love to check out the cookbook. Here's my entry! Hope I win!